What would be the impact of carbon legislation in the U.S., specifically a cap-and-trade system, on the heating, ventilation, air-conditioning, and refrigeration (HVAC&R) equipment manufacturing industry? Johnson Controls recently presented one perspective on the opportunities such a policy would create to the American Society of Heating, Refrigerating, and Air-Conditioning Engineers (ASHRAE). Companies expect and are preparing for climate legislation. According to the recently released 2010 Energy Efficiency Indicator (EEI),1 75% of executives and facility managers responsible for commercial buildings in North America believe that significant legislation mandating energy efficiency or carbon reduction is somewhat to extremely likely in the next two years. Of that number, 36% believe such legislation is very to extremely likely. While these percentages have fallen slightly from 2009, the majority of businesses continue to expect major legislation relatively soon. Many companies have already begun to set voluntary carbon reduction targets in anticipation of major legislation (51% of the Global 500 have done so), and many have begun taking active measures to reduce their GHG emissions. Among North American respondents to the EEI survey that have prioritized climate strategies, 47% have pursued building energy efficiency as their top carbon emissions reduction strategy (Figure 1). This shows that a nationwide cap-and-trade system would present a tremendous growth opportunity for the HVAC&R industry, as its customers upgrade to more efficient systems. Energy price impact of legislation will be low compared with business as usual energy price increases. Despite this opportunity, some believe it will come at a cost to manufacturers in the form of increased energy prices. How significant an increase? An independent report published by the Energy Information Administration (EIA)2 showed that the medium- and long-term effects of a price on carbon (under the American Clean Energy and Security Act of 2009 or the “Waxman/Markey bill”) would have far less effect on the prices of electricity and natural gas than the anticipated natural growth in those prices. 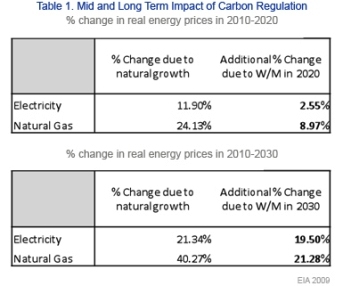 Whereas climate legislation is expected to increase energy prices by 3% for electricity and 9% for natural gas over the next 10 years, respondents to the 2010 EEI survey expect energy prices to rise by an average of 9% within the next 12 months alone, an expectation supported by EIA data on natural energy price growth. 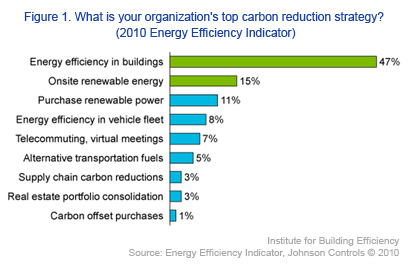 Energy efficiency in buildings is the largest and most cost effective opportunity to reduce emissions. Energy efficiency is considered to be the most cost effective method of reducing greenhouse gas emissions and will ease the cost of a carbon cap-and-trade regime. McKinsey estimates that there are potentially 9.1 quadrillion BTUs of annual energy savings that could be captured through energy efficiency by 2020, nearly 10% of total annual U.S. energy consumption. Based upon medium-term energy price forecasts, this would result in roughly $177 billion in annual savings, to say nothing of non-energy related savings such as reduced maintenance. In addition to a price on carbon, complementary policies are needed to overcome market barriers. Given its relatively modest impact on energy prices, a carbon price would have only a small effect on the growth of the energy efficiency market. Even at a price of $50/ton, the total opportunity (in terms of total quadrillion BTUs available through NPV-positive projects) only increases by 13.2%.3 Complementary policies are needed in order to get true momentum behind the energy efficiency market, with the goal of reducing emissions as cost-effectively as possible under a cap-and-trade system. 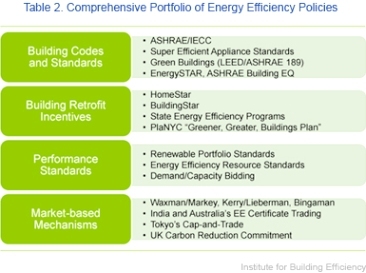 Table 2 lists a few of the most important policy options in place or being contemplated to help overcome barriers to realizing the full economic potential for energy efficiency improvements. The HVAC&R community faces another, more industry-specific concern, namely the regulation of hydrofluorocarbons (HFCs), which are both a common type of refrigerant (e.g. R32, R125, R134a) and a class of potent greenhouse gases. The Montreal Protocol currently calls for a complete phase-out of HCFCs by 2030 and many are calling for a global cap and phase down of HFCs as well under that protocol. Some see fluorinated gas regulation as an opportunity to reduce global warming impacts more quickly and cost effectively than is possible through regulation of carbon dioxide emissions. While any phase-out creates a burden for HVAC&R manufacturers, market-based mechanisms–such as a cap-and-trade system based on global warming potential equivalence (e.g. tons CO2e)—will result in lower costs for both producers and users compared with direct regulation. A cap-and-trade system would allow businesses the flexibility to innovate, find new refrigerants and reduce enforcement costs for government agencies until the Montreal Protocol/UNFCCC coordination process establishes the roadmap for the global transition. The HVAC&R industry will benefit from comprehensive and market-based climate policies. It is clear that major legislation limiting greenhouse gas emissions comes with some cost, but that cost is often overstated. It is not often accompanied by an explanation of the business opportunities that are created or the innovation that this policy can enable. The HVAC&R manufacturing industry will benefit from comprehensive climate policies with market-based reduction strategies that accelerate investment in energy efficiency, and should be active in promoting a raft of other complementary policies that also help to accomplish the cheapest form of greenhouse gas abatement available to us.